For those that were in the rules meeting, you now understand the intricacies of dodgeball and the difficult choices that need to be considered to create a complete dodgeball rulebook. 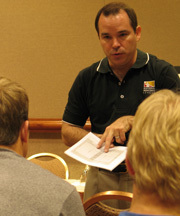 The National Dodgeball League unveiled its first edition of the Rulebook at the 2006 Convention. With some rules still needing some attention, it was a success for the league to be able to bring structure and organization to this very scattered sport.